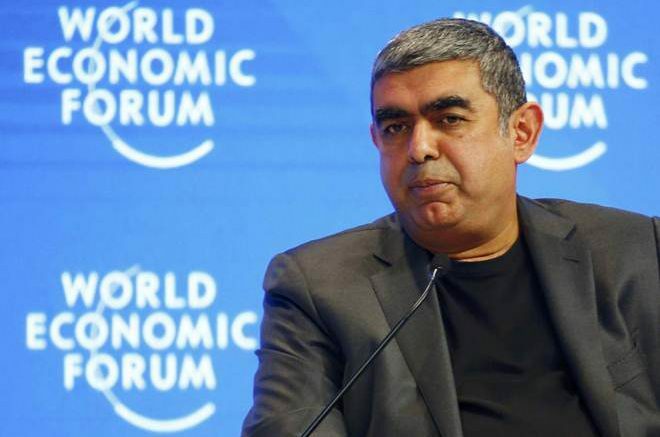 The denouement has been long in the making, but on Friday morning, when Infosys announced that its first non-promoter CEO & MD Vishal Sikka had resigned, it still came as a shock. Even more stunning was the unprecedented, frontal attack the board of Infosys mounted on the company’s co-founder N R Narayana Murthy, saying that Sikka had resigned despite “strong” board support and holding Murthy solely responsible for the departure of a “valued” CEO and harming employee morale. The reaction was sharp and instant, the Infy stock tanked over 10% and investors lost Rs 22,500 crore . 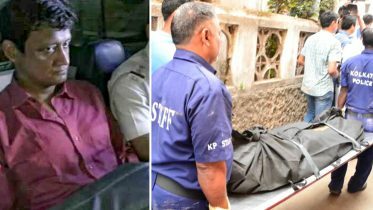 The loss for Narayana Murthy and family was Rs 850 crore. At one point in intra-day trade, it touched a 3-year low when it fell 13%, wiping out Rs 30,000 crore or nearly $5 billion of its market cap. U B Pravin Rao, COO and a veteran who’s spent 30 years with the company, has been appointed interim chief executive officer and managing director reporting to Sikka. In an unexpected turn, Sikka is staying as executive vice chairman till a new, permanent CEO takes over, not later than March 31, 2018. In another surprise move, the company’s co-chair Ravi Venkatesan told analysts in a call that given the current environment at Infosys, it might be difficult to get a good outside candidate. He said: “The challenge for anybody coming from outside, as Vishal experienced, is to manage the cultural adaptation, and then transform it. It is going to be challenging to find the right candidate. The CEO search is not going to be easy.” It was interpreted to mean that the next CEO would most probably be from the internal pool. This remark is interesting given that there is much talk in Bangalore’s IT circles that Venkatesan is interested in the CEO’s job himself. At a later press conference, he denied that he was aiming for the top executive position in Infosys. The board has also ruled out Murthy playing a formal role in the governance of the company, which many thought was on the cards until Friday. The simmering tension between Sikka and the board on one hand and the founders, led by Murthy, on the other, came out in the open early this year and has seen large amounts of dirty linen being washed in public. Murthy has led a campaign against what he termed as deteriorating “corporate governance” at Infosys. It first came to light when he and a couple of other promoters voted against the salary hike given to Sikka and the appointment of Punita Sinha to the board in April 2016. Later, he questioned the severance payout of Rs 17 crore to the then CFO Rajiv Bansal and the Rs 6 crore given to departing legal counsel David Kennedy. After a sustained campaign by Murthy, the board was forced to acknowledge that in paying out such large sums there had been an error in judgement and the bulk of the money due to Bansal was held back. The matter is in arbitration, currently. Another bone of contention was the acquisition of Israeli cloud company Panaya for $200 million in Feb 2015. The company, on the basis of whistleblower complaints, held independent investigations and concluded that there was no wrongdoing. Murthy has not subscribed to this and has continued to raise the issue. On Friday, a business daily reported on a mail that Murthy had purportedly written to some advisors in which he quoted some independent directors as saying Sikka was CTO (chief technology officer) and not CEO material. Within hours of the announcement of Sikka’s resignation, the board came out full guns blazing in his support, and against the co-founder, assuring various stakeholders that “it is committed not to be distracted by this misguided campaign by Mr Murthy”. The board also made startling disclosures which appear to fly in the face of the good corporate governance norms that Murthy has been championing. It said that Murthy demanded that the board adopt certain changes in policy, else he would attack board members in public; that it appoint specific individuals on the board; that it make operational and management changes under the threat of media attacks. 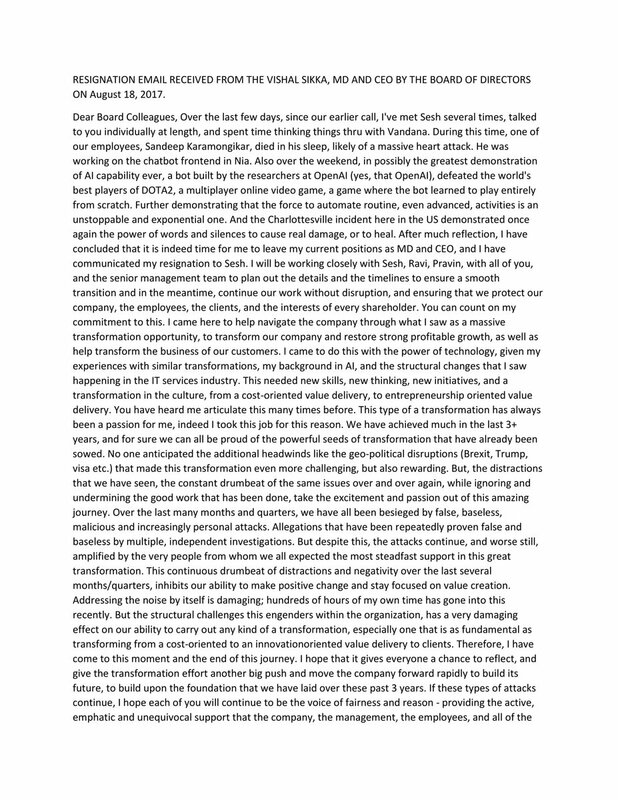 And, significantly, “Murthy wanted the demands to be adhered to without attribution to him,” the board added. 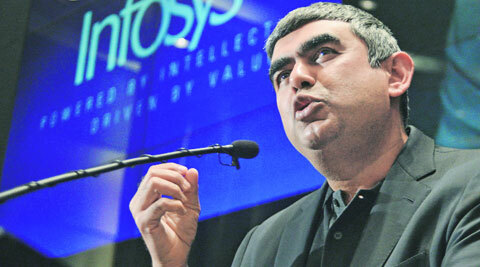 Be the first to comment on "Vishal Sikka quits Infosys on bitter note, board blames founder Narayana Murthy"